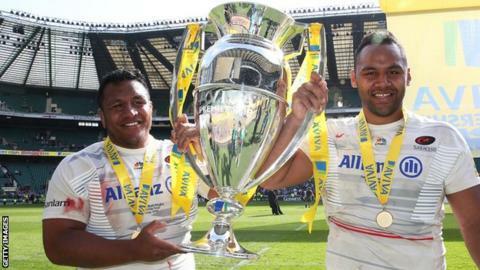 England internationals Mako and Billy Vunipola have extended their contracts with Premiership champions Saracens. Prop Mako, 25, and 23-year-old brother Billy, who plays at number eight, will remain at Allianz Park until the summer of 2019. "This is fantastic news for everyone associated with the club," Sarries director of rugby Mark McCall said. "To have two players of the calibre of Mako and Billy commit their futures to Saracens is extremely exciting." Loose-head Mako joined Saracens from Bristol in 2011, with Billy making the switch to north London from Wasps two years later. Both have become England regulars since joining the club, with Mako winning 29 international caps, while Billy has made 23 appearances for the national side. The pair featured in England's Six Nations victories against Scotland and Italy earlier this month. "What has been great for us is to witness the progression of both of them from promising youngsters to two of the world's best in their respective positions," McCall added. "Their contribution off the field is equally as important."